I found this on the kitchen table this morning amid a sea of holiday-related junk mail, catalogs and Christmas charity requests that my 6-year-old had opened. That last part is kind of intense, but who am I to argue with it? That does have a bit of a mafia-like warning to it. But I’d say neither the mafia nor Santa is worth messing with. As my uncle always says, pick your battles. You better cough up that five-spot. You would think we have been threatening her with Santa warnings, but I swear we haven’t. In fact she says she doesn’t think Santa is real, which is why I found it even more amusing/confusing. I think she’s trying to outsmart me and it’s a covert play to butter me up. 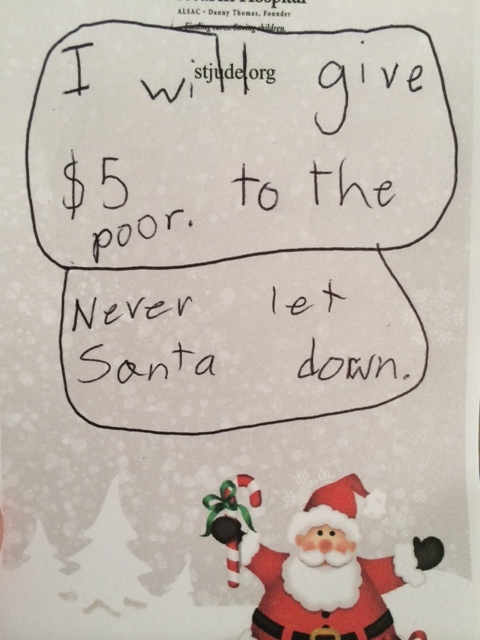 Aww I love how your child is so loyal to Santa.